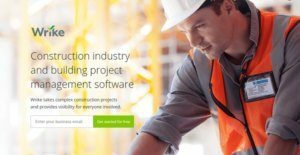 Wrike Construction Management Software Reviews: Overview, Pricing and Features. Wrike Construction Management Software is an all-in-one solution for builders who want to optimize their project management efforts. Equipped with plan visualization options, resource allocation tools, and time tracking solutions, this can easily simplify complex construction projects and help users get complete visibility of their operations. The platform also offers an intuitive and easy-to-use interface that both novice and professional users will surely appreciate. To top it all off, this full-featured solution has open API capabilities that allows it to blend in with a number of software ecosystems. This way, you can easily extend its functions or modify the platform depending on the unique needs of your business. Construction management requires tedious planning in order to make sure that your money, time, and other resources are being used to the fullest. This is why Wrike Construction Management Software offers a real-time Gantt chart to help you map out the tasks that need to be done per project. This allows you to see your target progress and quickly monitor if you are on schedule or not. For your convenience, this platform allows users to create templates for easier planning or to create from scratch to ensure full customization. One of the trickiest aspects of project planning is making sure that your staff members have manageable workloads. To help you ensure an efficient workload delegation, Wrike Construction Management Software has an intuitive workload view. This allows you to see the tasks assigned to each employee as well as the percentage of the day that they will use up for each task. With this, you can easily adjust workloads accordingly. Manually checking how much time your staff clocks in for work is difficult especially if project managers have to go from one site to another on a daily basis. By using Wrike Construction Management Software’s time tracking option, you and your project managers can track your staff members’ time on-site from any device and review the hour totals at the end of the month for more accurate payments. Wrike Construction Management Software allows you to maximize your resources. This is because the platform gives you complete visibility into your work in such a way that it is easy to track progress in line with costs and the time you allot for the different phases of your construction project. From ensuring that all of your staff members are being utilized to making sure that you are buying enough supplies for the project, this platform will surely come in handy. If you are considering Wrike it may also be sensible to analyze other subcategories of Best Construction Management Software gathered in our base of SaaS software reviews. Since each enterprise has particular business needs, it is advisable for them to refrain from searching for a one-size-fits-all perfect software system. Needless to say, it would be futile to try to find such a system even among widely used software platforms. The clever thing to do would be to jot down the various important factors that require consideration such as key features, budget, skill levels of employees, company size etc. Then, you should do your homework thoroughly. Read some Wrike reviews and look into each of the other apps in your shortlist in detail. Such comprehensive groundwork can ensure you weed out ill-fitting systems and choose the app that offers all the aspects you require for business success. Wrike Construction Management Software is available in 5 subscription plans that are priced depending on the needs of your business. We realize that when you make a decision to buy Construction Management Software it’s important not only to see how experts evaluate it in their reviews, but also to find out if the real people and companies that buy it are actually satisfied with the product. That’s why we’ve created our behavior-based Customer Satisfaction Algorithm™ that gathers customer reviews, comments and Wrike reviews across a wide range of social media sites. The data is then presented in an easy to digest form showing how many people had positive and negative experience with Wrike. With that information at hand you should be equipped to make an informed buying decision that you won’t regret.